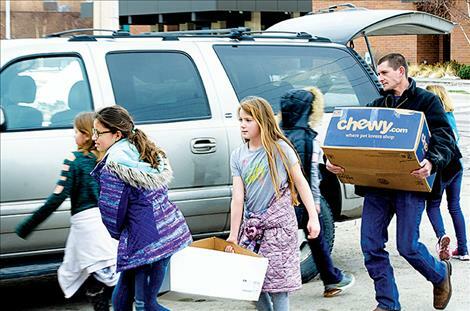 K. WIlliam Harvey students deliver 326 pounds of food to the Ronan Food Pantry Friday afternoon. 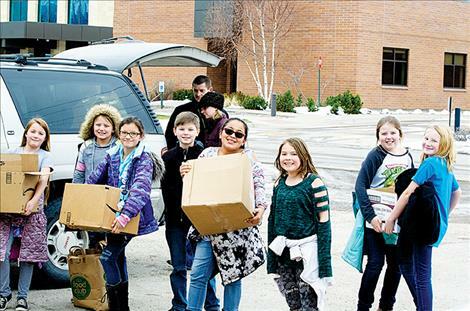 RONAN – A group of fourth-grade students at K. William Harvey Elementary gathered a hefty 326 pounds of food to help people in need as part of their leadership project. The leadership students collected donations from fellow students in all grades for two weeks and then packed the items into boxes. They had a few adults deliver the food to the Ronan Food Pantry, which is a food bank that has served families since 1987. 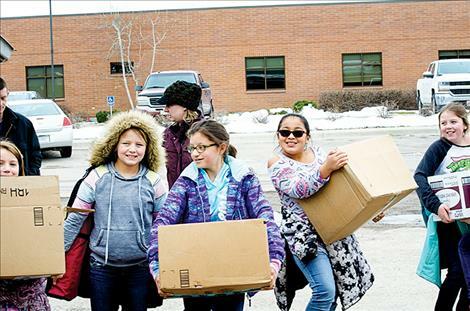 The students walked to the Food Pantry on Friday afternoon to unpack the vehicles and deliver the much-needed donations. The students working in this project included: April Uhrich, 9; Loren Olson, 9; Eternity Vincent, 10; William Normandeau, 10; Emily Skare, 9; Jaida Camel, 10; Hurley Victor, 9; and Aubrey Krell, 10.